Pilgrimage – Eat Me. Drink Me. The food was unassumingly described. 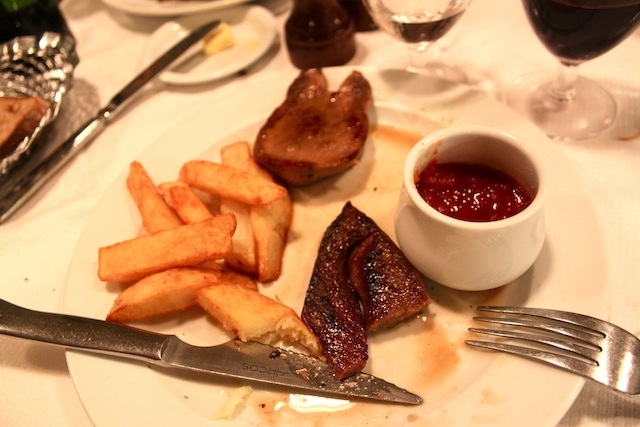 Ox tongue and chips. Pigeon and beetroot. I told my waiter I was deciding between those two things; he said, well, the pigeon was a really lovely gamey bird, perfect if I liked gamey meat, but the ox tongue, oh, the ox tongue was nice. I told him he hadn’t been very helpful and asked whether he’d rather have chips or beetroot. Oh, chips for sure, he said, and so I ordered ox tongue and chips. 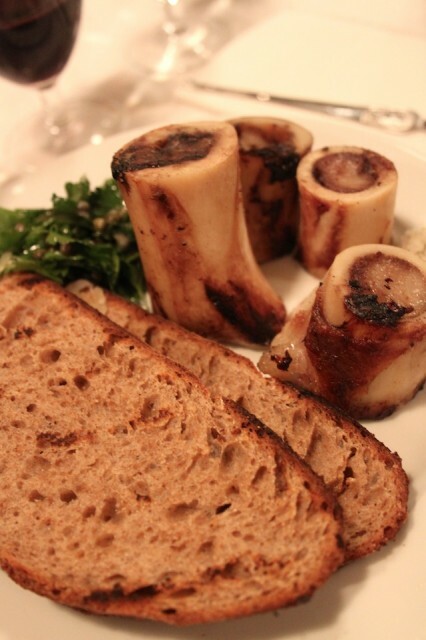 But first there was this bone marrow and parsley salad. Neither Ambrice nor Utsha had ordered an appetizer, so I was the only one eating – of course I gave them a taste – but the rest was mine. I am selfish. I didn’t care. I didn’t care that our food wouldn’t come until I had finished eating, that they wouldn’t begin to cook it until I had finished eating. And I didn’t care if they were hungry. I took my time. Because this was one of the most extraordinary things I’d ever eaten. The process was refined, with an undercurrent of visceral energy. One hand holds a thin, long spoon, silver with a lobster imprinted in the handle, and the other grips a hewed-off chunk of bone, glistening with grease and dripped fat from the animal’s self. 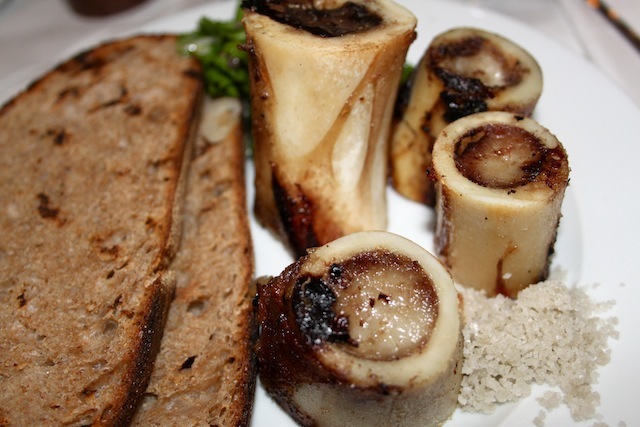 I actually dreamt last night that I had somehow missed all of the marrow in a piece of bone and no matter how furiously I scraped, I couldn’t seem to get it all. And then, suddenly, I found the font and my silver spoon excavated mound after miniature mound of creamy marrow. I think I’ve mentioned that I’m in love with Fergus Henderson – I have been, ever since I read his cookbook, The Whole Beast, a year and a half ago and subsequently spent ten days shoving groceries around a giant hunk of pork belly brining in the fridge. That belly, boiled for hours and served over supple, slow-stewed lentils, was the best thing I’ve ever made. I haven’t made many more of Fergus’ recipes – partly because they involve hard to find ingredients like lamb’s brain or pig’s blood and partly because they usually take more than ten days to make. As soon as I booked my ticket to London, I told my friends that the only thing I wanted to do, the first thing on my list of things to see, was Fergus Henderson’s restaurant. They were obliging. We sat in the center of the restaurant, pointing out beautiful men as they wandered in, peeking into the bustling kitchen, just sitting and drinking and listening to the tinkle of expensive conversations. The clientele was mostly older, CEOs with slicked-back hair and trim suits, women dripping pearls from their necks, but there were also younger couples, a woman in a green sweater and leather boots, two young men in jeans. Our waiter glided to the table with three plates, large, white, simply plated. 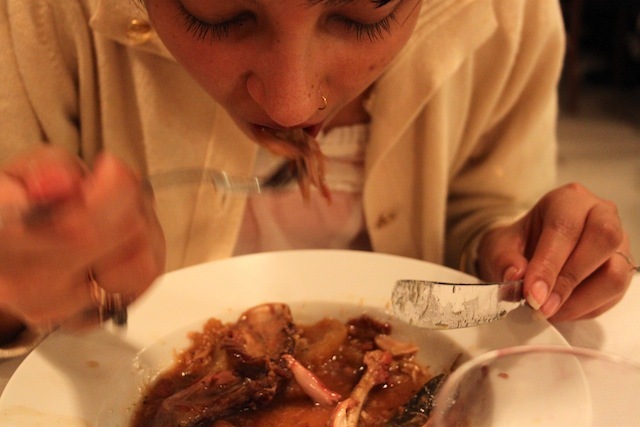 There was mutton and lentils for Ambrice, stewed rabbit for Utsha, and my tongue with chips. We tried bites of each others’ meals, gamey mutton and rich rabbit, tongue with the disconcerting ripple of taste buds running over taste buds but lovely and darkly dense, changing consistency from one part of the muscle to the next, some bites almost melting the way pork fat dissipates without having to be bit. We all stopped speaking. When the last hunks of bread had been dipped into Utsha’s rabbit sauce and the last sips of syrah drunk, we quietly gathered up our bags and stepped outside, solemnly, as if a great pilgrimage had just been completed. Or maybe that was only me. Maybe it was just for me that the air was crisper, the stars brighter, the food coma miraculous and magical in its weight. Probably. But in the tube on the ride home, I stared at my warped reflection in the window opposite, and it looked like a drip of bone marrow, just slipped from the bone. Pork belly, I’m sorry, but I have a new obsession, it seems.